This item is expected to ship 4-6 weeks after the event on April 25, 2019. The EKG and Chest X-Ray are the most commonly used procedures for diagnosing a wide variety of cardiac and respiratory conditions, yet even the most seasoned nurses struggle to master interpretation. And most importantly, respond to the patient emergencies associated with each of these changes! Analyze EKG changes associated with ischemia, injury and infarction patterns. Specify the features of right bundle branch block from the features of left bundle branch block. Evaluate axis deviation and the implications for clinical practice. Assess common cardiac and pulmonary disorders using the chest x-ray. Detect the placement of invasive lines on chest x-rays. 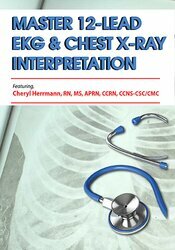 Develop a systematic approach to chest x-ray interpretation. Incorporate the clinical pearls of EKG and chest x-ray interpretation into daily practice. Cheryl Herrmann shares her vast cardiac knowledge and experience to provide an interactive, dynamic, high-energy and easy-to-understand seminar. Her 35+ years of clinical experience include 15 years as a bedside critical care nurse and over 20 years as a Cardiac Clinical Nurse Specialist with hospitalized and clinical cardiac medical and surgical patients. In addition, Cheryl is a Prehospital RN for the local ambulance service. She is a popular speaker for local, regional and national conferences, including presenting at the American Association of Critical Care Nurses, NTI, for the past 10 years. Cheryl has also been a team leader for medical-dental teams going to Mexico and participated in a Critical Care Nursing Ambassador program to China. Cheryl is a published author and a previous recipient of the American Association of Critical Care Nurse Circle of Excellence - Excellent Clinical Nurse Specialist Award. She presents material in a way that all health professionals caring for the cardiac patient, regardless of where they are in the continuum, take home valuable pearls of wisdom and new skills. Financial: Cheryl D. Herrmann has an employment relationship with UnityPoint Health Cardiology. She receives a speaking honorarium from PESI, Inc. Non-financial: Cheryl D. Herrmann is a member of the Illinois Society of Advanced Practice Nurses and National Association of Clinical Nurse Specialists.